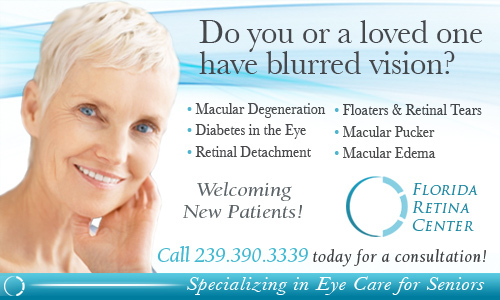 I am Saurabh Patel, MD, MSc, the owner of Florida Retina Center, at the Retina Eye Care building in Bonita Springs, FL. Patients who come to see a Retina specialist are often apprehensive about their eye condition and require a higher level of compassion and caring. In today’s environment of rising health care costs and medicare cuts, physicians are being pushed by insurance carriers to see more patients in shorter periods of time, which reduces the face to face communication time with your doctors. You deserve to have your questions answered and become educated about your condition. However, as you know, not all doctors are the same, and in some places you don’t get the answers you are looking for. You will get answers to all of your Retina and Macula questions here in my clinic. It is concerning to me that some new patients come to my clinic with stories of chronic vision loss, and when I ask what was tried to improve their vision, the patient responds “I was told there was nothing that would help me”. Some patients are new to the area and referred to me by their friends, neighbors or family, while other patients wind up seeking a second opinion after becoming frustrated with their chronically poor vision. These patients are often not aware of their existing treatment options. Occasionally, they were told that their condition was too old to be treated. I make it my personal mission to ensure you have all possible options made available to you, and the knowledge to make an educated choice about your treatment. I strive to provide the highest standard of eye care, while allowing time for “that personal touch” `so that you feel comfortable with your exam and confident in your treatment. I utilize the most up to date techniques and equipment, and employ a knowledgeable staff dedicated to your needs. You may feel free to ask questions about your care, and voice concerns about your vision to any of our staff members. In addition, we have a wide variety of educational materials available to you. My training at Johns Hopkins gave me a solid foundation, paving the way for me to obtain extensive experience in difficult to diagnose Retina and Macula disorders. I take pride in my expertise, making me the “go to” surgeon in Southwest Florida for complicated retinal procedures. I also utilize special surgical techniques in common retina cases, allowing for optimal healing and vision outcomes for my patients. I will always offer you choices and advice that are geared toward giving you the best quality of vision possible for you. If the treatment you need is not within my range of expertise, I will seek out qualified eye doctors who specialize in your condition. If I can help you or a member of your family, please call my office and schedule an appointment. Washington Hospital Center in D.C.
for macular degeneration and diabetic retinopathy.